Yes, little a baked Christmas cookies too. I’m not going to lie – baking doesn’t really appeal to me. I love baked goods. Love, love, LOVE to eat them. Look at those? How could you not love those cookies? And trust me – they taste just as good as they look. I should know. I ate enough of them in the past few days. Baking, though, requires a level of accuracy and finesse that I just struggle with. I don’t like to measure things when I cook or use timers. I like it when I can “eyeball” it and “feel” it. You know what happens when you do that with baking? Hockey pucks happen. And no one wants to eat a hockey puck. Even if it’s frosted. So, I don’t bake much. But traditions must evolve and adapt, as must our cookie tray. We have some great “traditional” cookies. 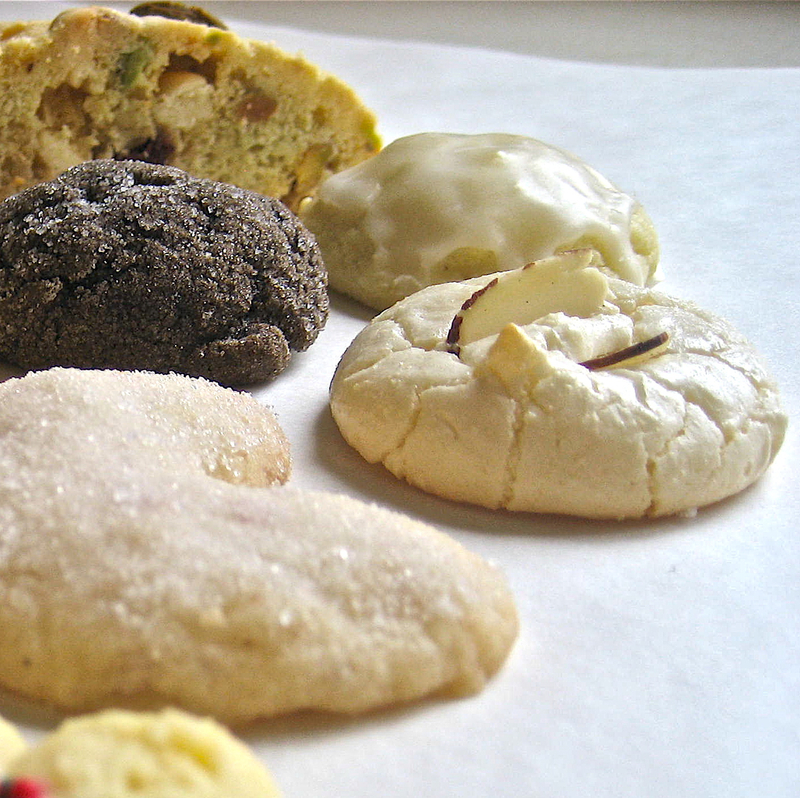 Every Cookie-Baking Day starts with Spritz. Even though Spritz guns are a pain, the cookies are always worth making. They come out so cute and buttery and, besides, it’s fun to play with sprinkles. I made the ones in the picture, but, we all make a few batches of different Spritz. Big A made her family/favorite childhood recipe Almond Crescents. Over the years, we’ve learned people like this Capuccino Crinkle and some kind of Almond-paste macaroon (this is Martha’s almond macaroon). 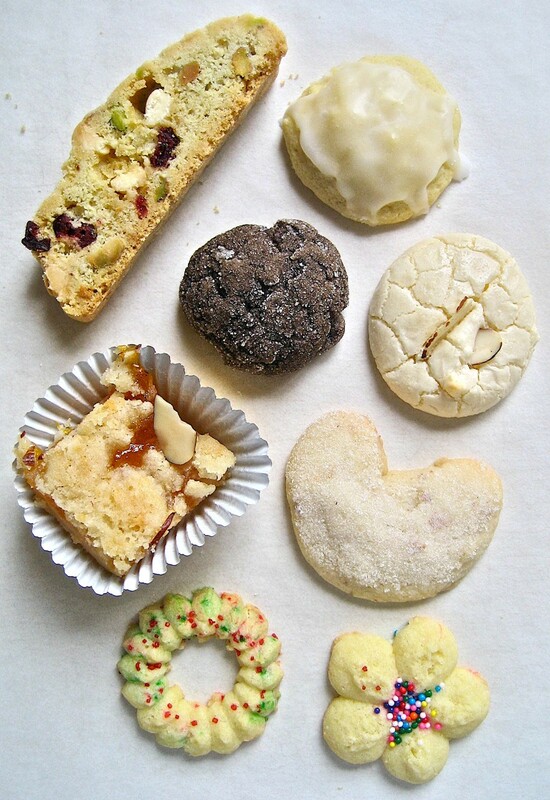 And the dropped and iced cookie on the top-right is a variation of another family classic, our Italian Christmas Cookie. The big challenge every year is to find new recipes that are just as good as the old ones. This year, I found two new recipes that we were really happy with: the Apricot-Orange Shortbread Bars, and I really wanted a Cranberry, Pistachio, and White Chocolate Biscotti, so we found a recipe for a good biscotti and modified it. Both went over well, and I think we’ll see them on cookie trays of the future. Loved you post and photos— and just so you are “a”ware little a, Aunt Linda put on at least five pounds since our three oven “Cookie Baking Day”. Next year, I’ll gladly forgo this new twist on an old tradition.